SJSU will open a Center for Excellence in Adaptive and Blended Learning. The expanded collaboration follows a successful pilot that increased pass rates. SAN JOSE, CALIF. – Thousands more California State University students will benefit from a major expansion to the collaboration between San Jose State University and edX, the not-for-profit online learning enterprise founded by Harvard University and the Massachusetts Institute of Technology (MIT). SJSU and edX detailed this announcement at a news conference April 10. View the video. An online engineering course in circuits and electronics — created by MIT as an MITx course for the edX platform and offered to San Jose State students for the first time last fall — will be made available to as many as 11 other CSU campuses. The expansion will benefit thousands of students from nearly half of Cal State’s 23 campuses. San Jose State will concurrently establish a Center for Excellence in Adaptive and Blended Learning to train faculty members from other campuses interested in offering the engineering course and other blended online courses in the future. Once trained at San Jose State, faculty members from other CSU campuses will be equipped to incorporate the MITx 6.002x Circuits and Electronics course offered on the edX platform into their own blended classroom settings. This means students from participating CSU campuses will have access to the rigorous curricular materials — readings, video and interactive exercises — wherever they study, and then meet in class for in-depth discussions and group work facilitated by local professors. The agreement also sets the stage for the SJSU-edX collaboration to expand well beyond engineering to the sciences, humanities, business and social sciences. SJSU will pilot additional courses from several edX universities including Harvard, MIT and the University of California, Berkeley. During SJSU’s fall 2012 EE98 Introduction to Circuits Analysis course, SJSU Lecturer Khosrow Ghadiri used the MITx 6.002x Circuits and Electronics materials on the edX platform. His class, comprised of 87 students, viewed the MITx video lectures and completed MITx problem sets outside of class. During class, Ghadiri facilitated 15 minutes of questions and answers, and then devoted the remainder of the class to peer and team instruction and problem solving using materials developed by SJSU faculty members. Early indicators have been remarkably positive. Although the numbers of students were small and classes differed on many factors, the pass rate in the blended class was 91 percent, and the pass rates in the conventional classes were as low as 55 percent. This spring, SJSU is repeating the experiment with a second section of the same size, refining an approach that could one day be applied not just to engineering, but to students in all STEM (science, technology, engineering and math) fields. 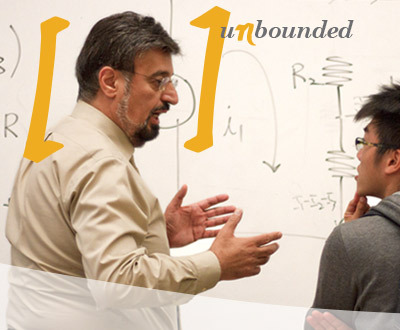 At the core of these innovations are faculty members trying new ways to infuse technology into teaching and learning. To support faculty members as they embark on this trailblazing work, SJSU will establish a Center for Excellence in Adaptive and Blended Learning. The center will open this summer with a focus on the MITx circuits and electronics course. Initially, the center will serve faculty members at the 11 participating CSU campuses. Over time, the center could grow to serve all of the nearly 22,000 faculty members and more than 426,000 students of the CSU system. Under the leadership of SJSU Provost and Vice President for Academic Affairs Ellen Junn, the center could also expand to serve other public and private colleges and universities worldwide. The expansion of SJSU’s collaboration with edX is part of a campaign led by President Qayoumi, who argues that educational institutions urgently need new approaches to teaching and assessing learning that are personalized, collaborative, engaging and relate to real-world, 21st-century problems. 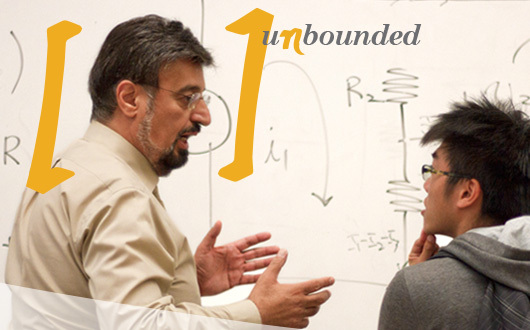 Join the conversation at Unbounded: Teaching and learning without limits. San Jose State — Silicon Valley’s largest institution of higher learning with 30,500 students and 3,850 employees — is part of the California State University system. SJSU’s 154-acre downtown campus anchors the nation’s 10th largest city. EdX is a not-for-profit enterprise of its founding partners Harvard University and the Massachusetts Institute of Technology focused on transforming online and on-campus learning through groundbreaking methodologies, game-like experiences and cutting-edge research. EdX provides inspirational and transformative knowledge to students of all ages, social status, and income who form worldwide communities of learners. EdX uses its open source technology to transcend physical and social borders. We’re focused on people, not profit. EdX is based in Cambridge, Massachusetts in the USA.